Heading to the Czech Republic? Cesky Raj is a must-see destination for those traveling through this beautiful country. Hiking Cesky Raj was by far our favorite experience in the Czech Republic. 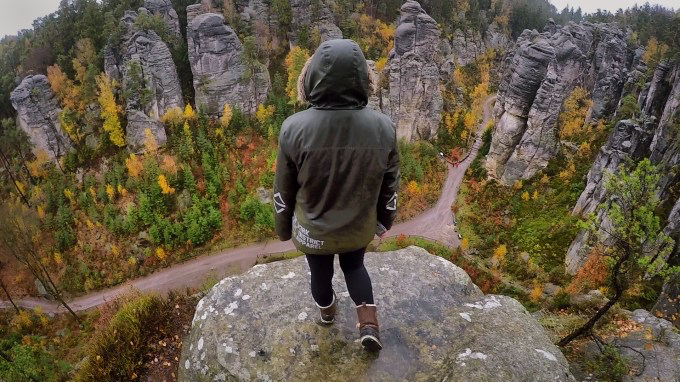 We hope this article inspires you to hike Cesky Raj and gives you the information you need to find the Bohemian Paradise easily! It is easy to make a budget-friendly day trip to Cesky Raj from Prague. Book your bus ticket via RegioJet. All buses will depart from Cerny Most (Prague’s main bus station) and arrive at Jicin (the town which you will get to Cesky Raj from) approximately an hour and a half later. Round trip tickets are 16.80 EUR. Once you arrive in Jicin, you can walk or take a taxi (we recommend taking a taxi) 5km west to Prochovske Skaly, the most accessible of the Cesky Raj rock formations. Entry into the park is about 2 EUR for the entire day, which you deposit into an honor box. Sure, you could walk on in without paying. But it’s only 2 euros and the money goes to preserving the park and helping with the upkeep of the trails. Don’t be lame. Take that big, pretty 2 euro coin out of your pocket and throw it into the box. *Note: You can reach the rock formations of Cesky Raj from Turnov and Male Skala, as well as Jicin. However, since most people will go from Prague, this article will cover getting there from Jicin, the closest city to Prague that you can reach the rocks from. All trails are marked and relatively easy to hike. Although there will be many steps to get to the upper parts of the trail, we found the hike very easy and saw many families there with their children. We spent the entire day (from 9am-4pm) leisurely walking around enjoying the views. Since we went in fall, the lodge was closed but if you are going in the spring and summer expect it to be open to visitors for dining. The park is dog friendly as well, so feel free to bring your furry friend along for the journey. Sara chilling in a rock cave at Cesky Raj, Czech Republic. If you do decide that you want to spend more than a day here, there is plenty of accommodation in Jicin. There are camping sites like this one here you can pitch up your tent at. If you’d rather stay in a hotel, we are in love with Hotel U Krale, which runs about $65/night and has such a cute homey feel! Breakfast is also included in the price, and they don’t just serve the typical European bread with jam breakfast, but a full spread of meats, cheeses, breads, and eggs! Breathtaking views at Cesky Raj, Czech Republic. This probably wouldn’t be something you would be able to do in a day trip along with Cesky Raj, but if you do decide to stay over night then you should really take the time to explore the quaint town of Jicin. Perhaps the most popular site is the Valdice Gate (“Valdicka Brana”). This historical tower from the Renaissance gives you a great view of the city from the top. The price to climb the tower is 30 Kc, or about 1 EUR. The Cerovka lookout tower in the north of Jicin gives you some more stunning views, and is free to climb up. There’s a little bit of a hike to get to the tower, but once you are up you’ll be blessed with some gorgeous views. The Zebin hill is another hour-or-so activity. Atop this volcanic hill lies the Zebin chapel, a cute little Baroque-style chapel of St. Mary Magdalene. At its peak, Zebin hill also gives you amazing panoramic views of the Prachovske Rocks. Wanna purchase a guidebook to the Czech Republic? We recommend Lonely Planet’s guide. Purchase it on Amazon by clicking here. Have you guys every been to the Czech Republic? Do any hikes or uncover any bohemian gems? Let us know in the comments section below!